Consumer confidence remained strong in two surveys released in late July, and employers added 157,000 jobs during the month, indicating that the economy continues to expand despite fears about President Donald Trump’s tough trade policies. The upbeat readings on consumer confidence came after the economy grew 4.1 percent in the second quarter — its best performance since the third quarter in 2014. A $1.5 trillion federal tax cut boosted consumer spending, which rose at a 4 percent rate in the second quarter. Spending by consumers accounts for more than two-thirds of U.S. economic activity. “If we look at where the economy is now, at full employment, the economy’s growth is constrained by how fast the labor force is growing,” Robert Murphy, associate professor of economics at Boston College, tells CBS News. “That depends on the birth rate, and it also depends on immigration, and it’s not going to change in the short term unless you radicalize immigration policy. “You can pump up demand in the short term — that’s what a tax cut does — but you can’t sustain it, because you’re not going to have the resources to keep pushing at that rate,” he adds. The Conference Board’s Consumer Confidence Index rose slightly, to 127.4, in July, and is not far from the reading of 130 in February that was its highest in 18 years. “Consumers’ assessment of present-day conditions improved, suggesting that economic growth is still strong,” Lynn Franco, director of economic indicators at The Conference Board, says in a statement. The business research group’s Leading Economic Index rose 0.5 percent in June after being unchanged the previous month, “pointing to continuing solid growth,” Ataman Ozyildirim, director of business cycles and growth research at The Conference Board, says in the statement. The index attempts to predict future economic activity. “The widespread growth in leading indicators, with the exception of housing permits, which declined once again, does not suggest any considerable growth slowdown in the short term,” Ozyildirim says. The University of Michigan’s Consumer Sentiment Index posted what Richard Curtin, chief economist of the university’s Surveys of Consumers, says was a trivial 0.3-point decline, to 97.9, for July. That result was 0.2 points above the index’s solid average for the prior 12 months. Settling the trade disputes “is critical to forestall decreases in consumer discretionary spending as a precaution against a worsening economy,” he adds. Joan Maxwell, president of Regulator Marine, believes the overall economy is healthy, as the second-quarter GDP figures showed, but she is likewise concerned about the impact that Trump’s tariffs could have on the United States. She says Regulator is doing little exporting into the European Union right now and does not have a dealer presence in Canada, so the company is not likely to feel sales effects from the tariffs. 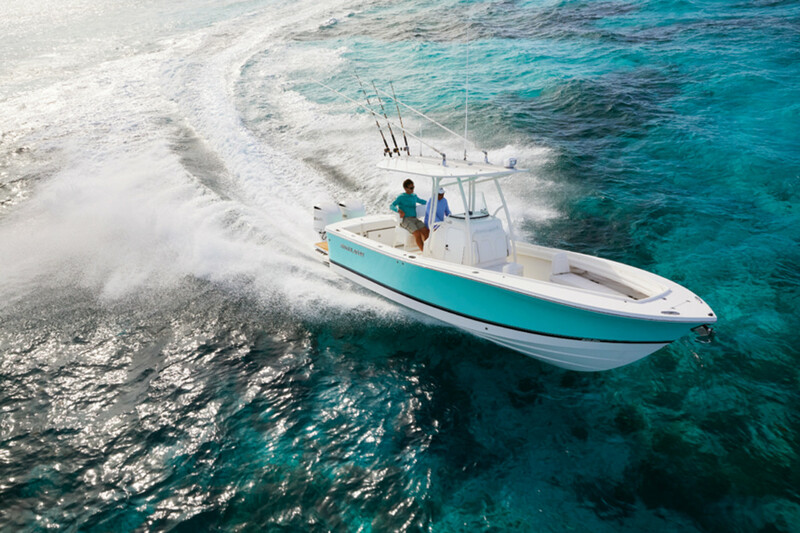 Maxwell says Regulator regularly watches the stock market and economic forecasting firm ITR Economics’ monthly Trends Reports in assessing the company’s and the boating industry’s chances for success. “Boats are discretionary expenditures, and when the stock market is volatile, customer confidence tends to wane,” she says. “We review the ITR Trends Reports for signs that there could be a softening of the market, flat or growth potential. These trend reports help us spend more time looking through the windshield and less in the rear-view mirror. “The ITR projections, our current production rates and our backlog gave us confidence that the time was right to begin an expansion of our manufacturing facility, slated to come on line sometime in Q1 2019,” Maxwell adds. The jobs picture continues to brighten. The Labor Department said in early August that in addition to the 157,000 new jobs it was reporting for July, it revised its May and June figures upward by a total of 59,000. That brought the average for the past three months to 224,000 jobs. The unemployment rate dropped slightly, to 3.9 percent. The government says average hourly earnings rose by 7 cents, or 0.3 percent, to $27.05, in July, and they are up just 2.7 percent on a year-over-year basis. Pay growth has been sluggish in recent years despite the economy’s lengthy and durable recovery from the Great Recession. Gapen also believes wages will start to rise faster. “There is such a thing as slack in labor markets being removed, and scarcity puts upward pressure on prices somewhere,” he says. The Labor Department says jobs were added in professional and business services (51,000), manufacturing (37,000) and health care (17,000) in July. During the past 12 months the economy added 518,000 jobs in professional and business services, 327,000 in manufacturing and 286,000 in health care. For the moment, interest rates remain steady. The Federal Reserve’s policy-making committee voted unanimously to make no change to the benchmark federal-funds rate at a meeting that ended Aug. 1. However, a statement the central bank made after the meeting — describing current economic activity as “strong” — suggested to economists that another rate increase could come as soon as September. The Fed raised rates in March and June. Meanwhile, the housing market continues to show signs of a slowdown. The Commerce Department says new-home sales were at an eight-month low in June — a seasonally adjusted annual rate of 631,000, 5.3 percent below the May rate of 666,000, which was revised downward from an initial figure of 689,000. The government also says housing starts showed a double-digit decline in June, falling 12.3 percent, to a seasonally adjusted annual rate of 1.17 million, the lowest level since September 2017. Building permits were also at their lowest levels since that month, falling 2.2 percent to 1.27 million units in June. “The housing market is flattening and may have peaked for this expansion,” Robert Frick, corporate economist for the Navy Federal Credit Union, tells Reuters. Existing-home sales fell for the third consecutive month in June, dropping 0.6 percent, to a seasonally adjusted annual rate of 5.38 million from a downwardly revised 5.41 million in May, the National Association of Realtors says. Declines in the South and West exceeded increases in the Northeast and Midwest. “There continues to be a mismatch since the spring between the growing level of home-buyer demand in most of the country in relation to the actual pace of home sales, which are declining,” NAR chief economist Lawrence Yun says in a statement.